Do your kids need to work on their math basics? Need a refresher yourself? Tired of flash cards? 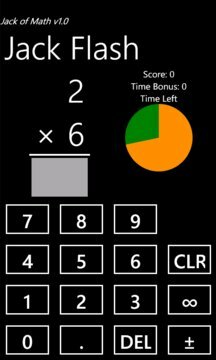 Jack of Math can help you hone your math skills in addition, subtraction, multiplication, division, squares, square roots, and more. 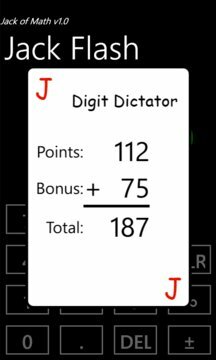 In Jack of Math, you can set the range of the operands, the number of problems to test, and control the order and time limit. View graphs of the increase in your accuracy, score, and response time. - Removed delay between questions on successful answer. - Answer font sizes as needed for larger answers. - Operand ranges are limited. - Allow negative answers toggle was reversed. Fixed. - Accuracy report Y axis label goes to no more than 102%.